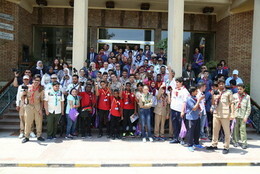 60 children from 9 Arab countries in the Arab Scout Forum for Media Young Professional Under the Slogan "The New Media Makers"
With the participation of 60 children (12-17 years old) from nine Arab countries: UAE, Bahrain, Saudi Arabia, Sudan, Palestine, Kuwait, Lebanon, Libya and Egypt, the 3rd Arab Scout Forum for Media Young Professional has been held under the slogan of "New Media Makers", during the period 14-18 August 2016 in Cairo, in cooperation between the Arab Scout Organization, ACCD, Alaeddin Children Magazine and Abjad Hawwaz Institution. The Forum aimed to provide the young scout with the elements and professionalism of media writing, as well as media skills, such as listening, speaking and photography, so as to be able to use and invest modern means of communication and to best deal with social networks. ACCD has organized a workshop with the children of the Forum to introduce the Convention on the Rights of the Child, especially with regard to issues of participation and media, in addition to providing children with an opportunity to express their views in the media through an open dialogue with children, presented by media professional, Mr. Atef Kamel.